The club was formed in 1882 and played in local Worcestershire and Warwickshire Leagues for the early part of their history. They joined the West Midlands (Regional) League in 1979, starting out in Division 2. a 4th placed finish in 1986 was good enough for promotion to Division 1 and despite finishing second bottom in their first season, a massive turnaround saw them finish as runners-up in 1988 and earn promotion to the Premier Division. After finishing as runners-up two seasons in a row in 1997 and 1998, they joined the Midlands Alliance. They won that league in 2001 and were promoted to the Southern League. In their debut season of 2001/02, they recorded the best ever finish in the club's history, finishing 8th in the Southern League Western Division, which at the time, was a step 3 league. 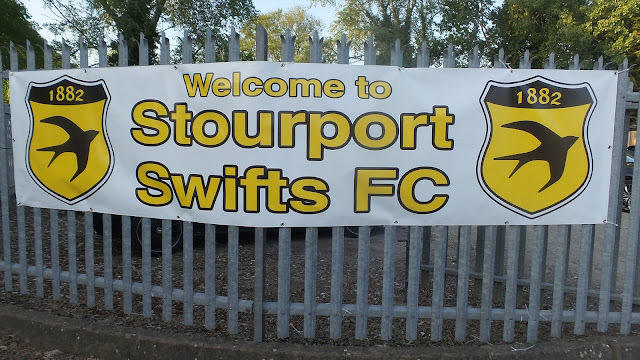 They couldn't keep up the momentum however and after a long run of lower-half finishes, they were relegated back to the Midland Alliance in 2012. Their first season back saw a good finish of 5th, and although they have dropped slightly since, they have still yet to finish outside the top half, with their latest season seeing a 12th placed finish. 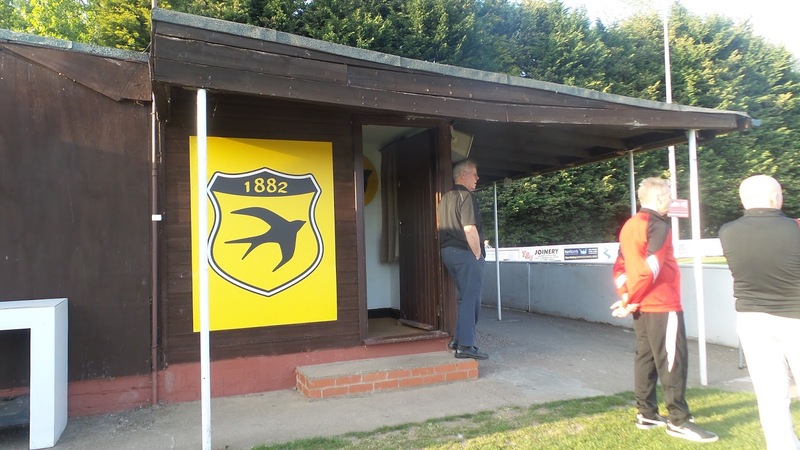 In the FA Cup, Swifts best ever seasons came in 2001 and 2002 when they reached the 3rd Qualifying Round two seasons in a row, losing to Enfield & Hucknall Town respectively. The FA Trophy 3rd Round was reached in 2001/02 and they took former Football League side Chester City to a replay, before eventually bowing out 3-0 in Cheshire. 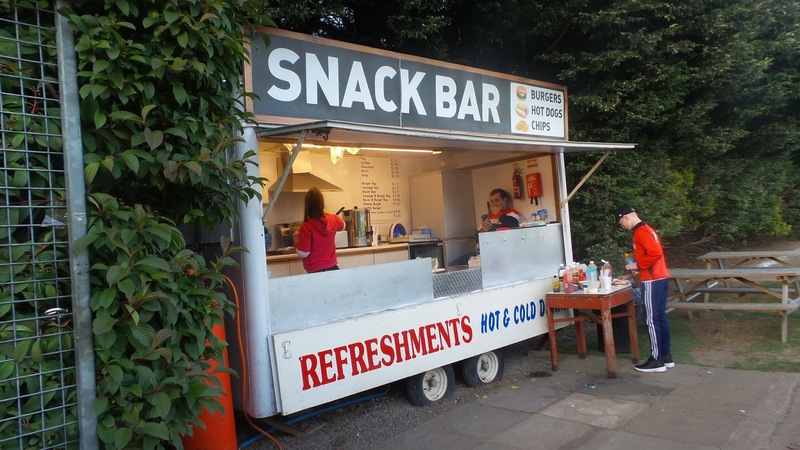 The season prior they had a great run in the FA Vase, reaching the 5th Round before a 4-1 defeat at Tooting & Mitcham. 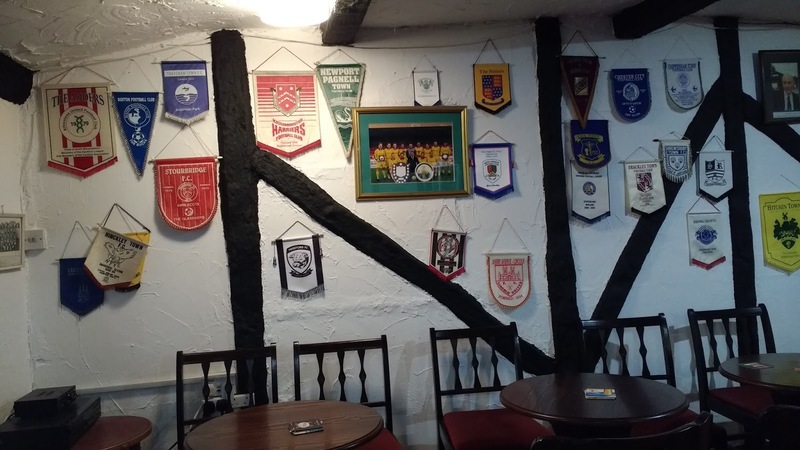 Locally, the club have won the WMRL Premier Division Cup in 1993, the Worcestershire Senior Urn on 4 occasions and the Worcestershire Infirmary Cup four times. 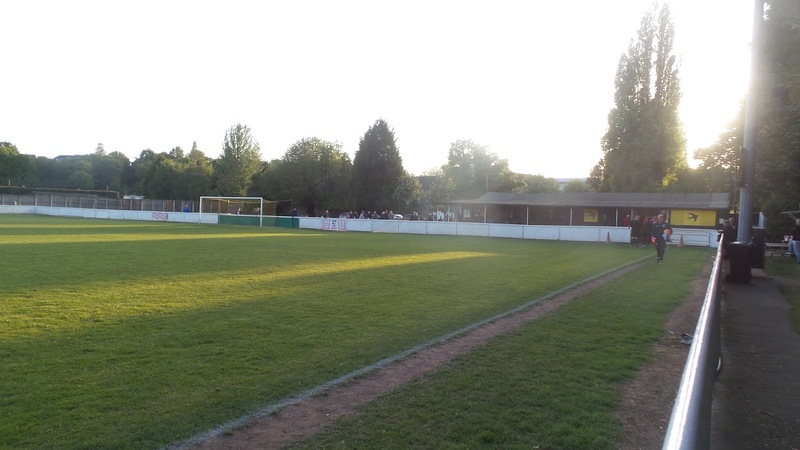 The club's record attendance of 1,321 came in a league game against Hereford in August 2015. 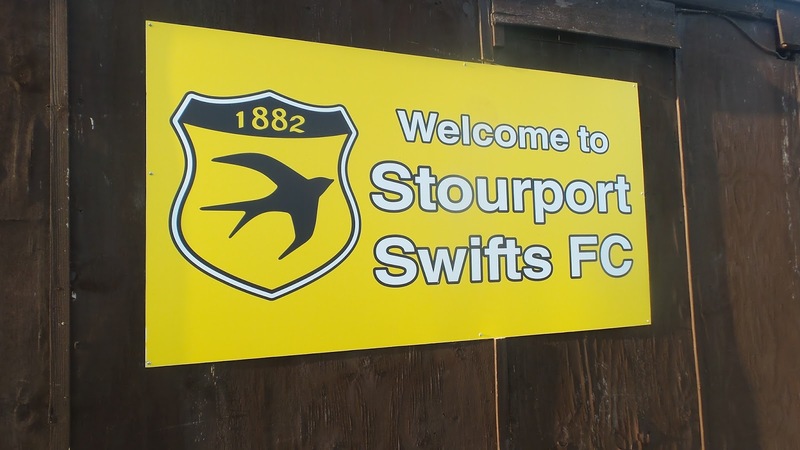 Stourport-On-Severn is a fairtrade town and was once home to former Prime Minister Stanley Baldwin as well as Wolves player Robbie Dennison. This game had been decided upon on Saturday when myself and fellow hopper Anwar were at the Wycombe game. Despite most leagues having packed up for the summer, there were still a healthy amount of options available to us. 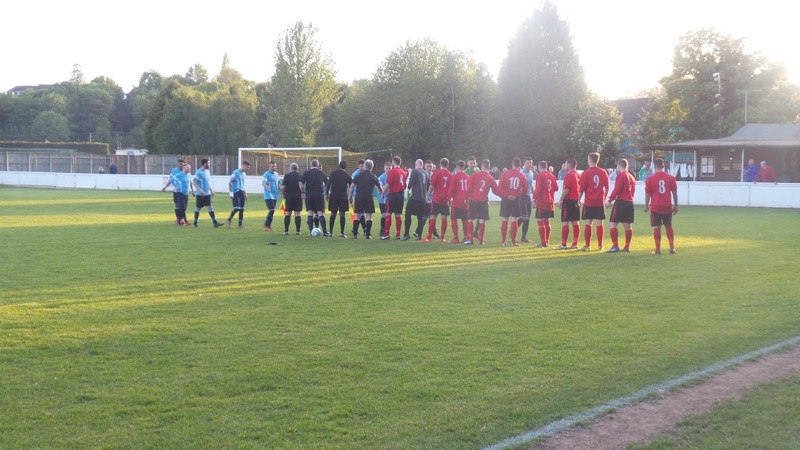 The likes of Loughborough and Instock were considered but in the end, we plumped for the Midland League Presidents Cup Final. It was to be contested by Alvis Sporting Club, whose home I had visited earlier in the season with another hopper, and Fairfield Villa. 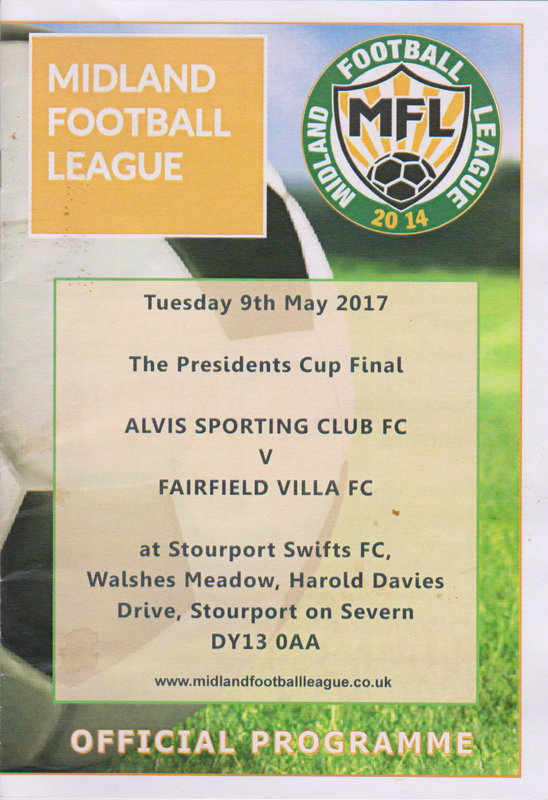 Alvis had got this far by beating Sutton United 3-1, Knowle 5-1 and then Barnt Green Spartak 6-3 in a thrilling semi-final. Fairfield Villa had reached the final by defeating Paget Rangers 4-3, Continental Star 4-0 and Coton Green 4-0. I was hoping that with an average of over 5.6 goals a game that this final would be a thriller, as all too often, finals are tight and tense affairs. Back to Saturday and by some kind of miracle, Wycombe provided an entertaining game, at least by our standards. All too often this season, the games have been painful to watch and although the 1-0 win over Cambridge doesn't sound much and meant that we missed out on the playoffs, it was a good game to watch and 9th place is not at all bad for a finish. It certainly meant that I looked less gloomily at the following busy two days at work, which included being treated like dirt by a complete jerk of a supervisor. I was, therefore, happy that the day of the game coincided with my day off. Normally I'd walk down town and get a lift back with my Dad, but as my parents were away, I had to do both legs. I did consider sacking it off and spending more time at home, but in the end I knew I needed the 8 miles walk for exercise. It was tarnished slightly by the bread pudding and bag of crisps I eat whilst walking though. I got back around 2.15, catching up on my YouTube subs and starting tonight's blog at the same time. I didn't get as much done on this and the blog I was updating for Reading FC, but by 3.35 it was time to get my stuff together and leave. I got to Anwar's just after 4, and he was there waiting for me. We had a good journey, listening to Jack FM and then Radio 2, arriving in Stourport at 6.10. We still had 90 minutes left until kick-off and so went in search of dinner. 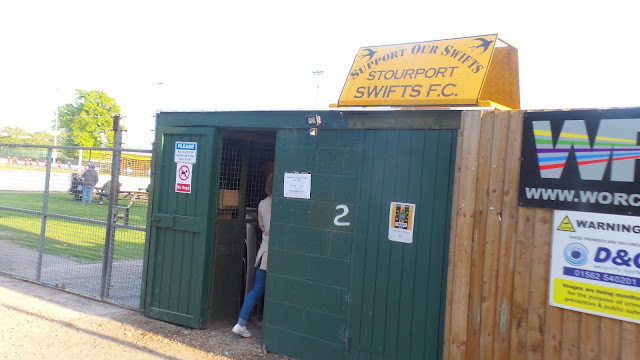 Stourport was a pleasant town by the river. First stop was the local Co-Op. They quite often have some local ciders and this one was no exception with a couple of new ones from Barbourne and a retry of Wobblejuice that is one of the best ones I've tried in the past. 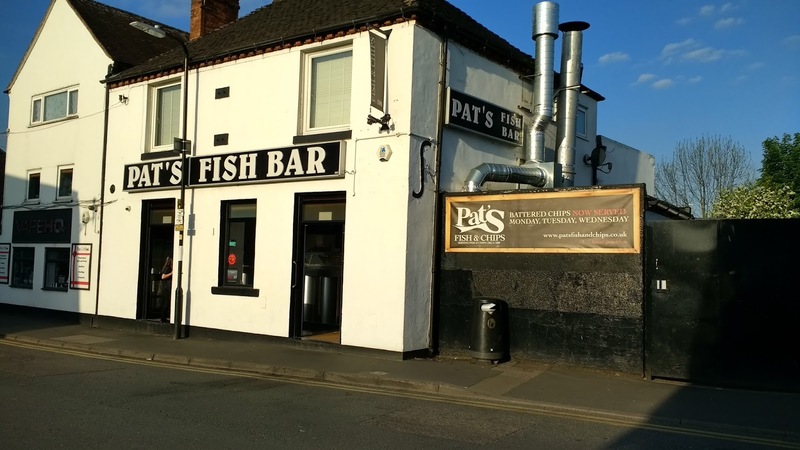 After that, I went to Pat's Fish Bar across the road where I had a generous portion of Faggots, Chips & Mushy Peas for £3.20 which were also very nice. After eating up, we made our way back to the ground, stopping at Heron Foods along the way where I got some mint poppets. 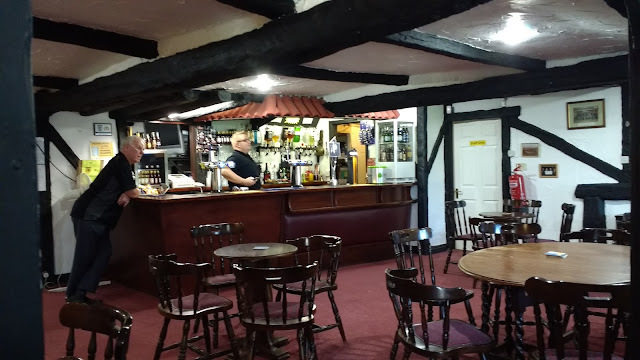 I also called in at the Bridge Inn where they advertised a 'new cider bar' but as I had already had the ones on offer, I decided to continue with my usual midweek abstinence. We got to the ground at 7.05, paying £5 to get in plus £1 for a decent programme. It was a pleasant spring evening and so I sat on the benches behind the goal while I caught up online and waited for the 7.45 kick off. The game started brightly, but with Fairfield Villa well on top. 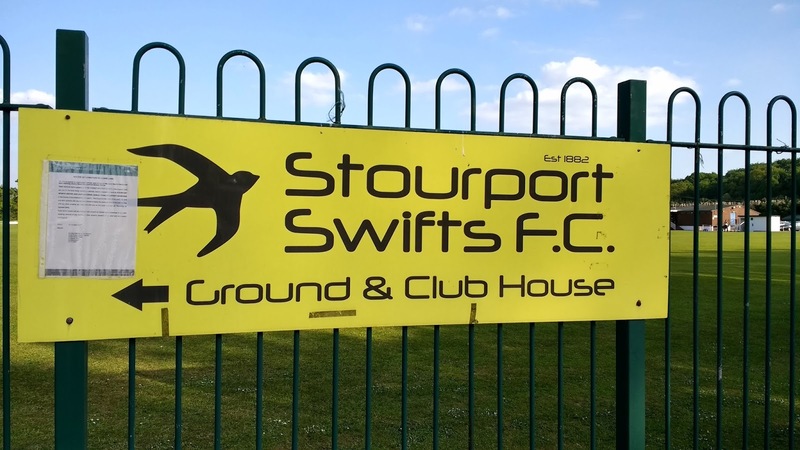 Both sides had already hit the post and Stuart Hall had a goal ruled out for Fairfield when they eventually took the lead on 26 minutes when top scorer Connor Collins low shot went into the bottom right-hand corner. Less than a minute later, the same player doubled the lead, this time the Alvis keeper got a hand to the shot from just inside the area but couldn't prevent it going in. Five minutes from half time, the game looked as good as over, Collins completing his hat trick when he poked home a loose ball to make it 3-0. The break came and went and Alvis came out a different side in the second half. They pulled one back on 49 minutes when a free kick was swung in from the right and Kiam Galdins headed home from the edge of the 6-yard area. The game had got pretty niggly by this point and there were plenty of meaty tackles going in and plenty of protests to the match officials. The linesman on our side gave back as good as he got, telling the player in no uncertain terms that his opponent had won the ball and it was not a foul. Both keepers made great saves to keep their sides in the hunt before Dildale Linton set up a tense finish with 6 minutes to go when he charged down the Fairfield keeper's clearance to make it 3-2. 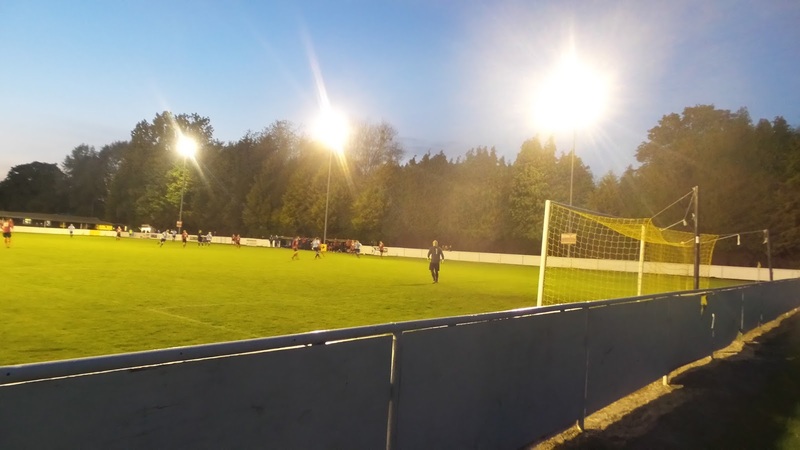 Villa clung on after this, clearing two shots off the line in an exciting finish with the post also being hit when the Alvis keeper came up for the last few corners. Overall, Fairfield Villa deserved their win though, having been the better side overall. We didn't hang around to see the presentation, however, as we both had work in the morning. It was 9.45 and we listened to Sol Campbell's 'My Sporting Life' on my podcast app on the way home. We got back to Aylesbury at 11.30, with me getting home myself 20 minutes later. I didn't get to sleep for another hour and despite being fine when I awoke at 4 in the morning, I was glad to grab 4 hours sleep the following afternoon. The fact that I had to drop my car in for repair and then walk 5 miles home probably helped me sleep, thanks to the recent damage caused by a wayward fox. This might impact on my footballing plans for Saturday would I be without a car. 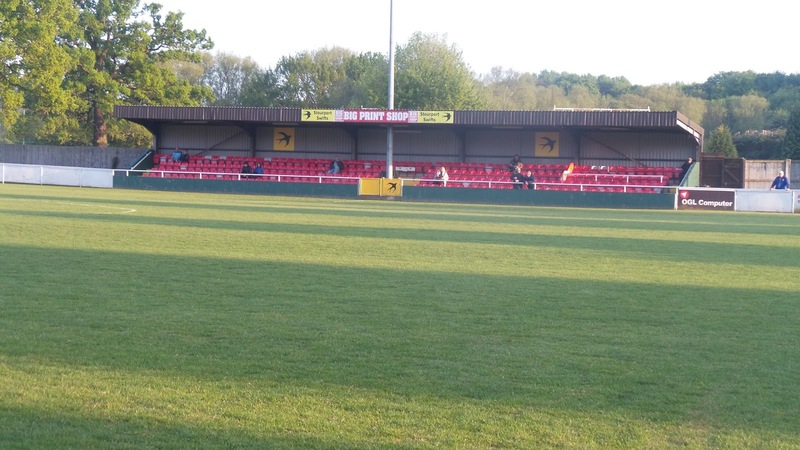 The preferred plan is a treble of Aylestone Park v Tamworth (played at Studley at 11) AEK Boco v Broadwell Amateurs (played at Stonehouse Town at 2.30 and Berinsfield v Saxton Rovers (played at Abingdon United at 7). 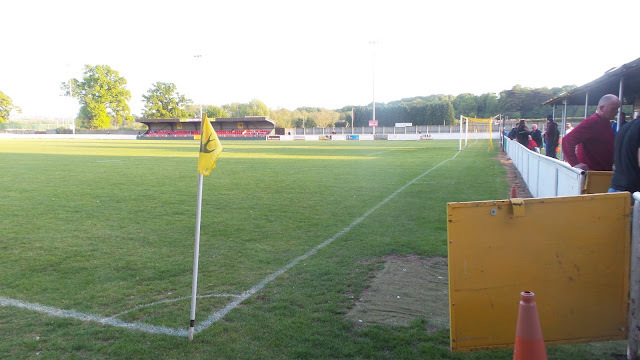 However, should I be without a car, I'll probably be at the mercy of public transport and go to a cup final at Bedfont which would also put pay to my revisit to Hemel Hempstead on Friday night. WALSHES MEADOW is a smart and well-kept ground which has seen service higher up the pyramid. 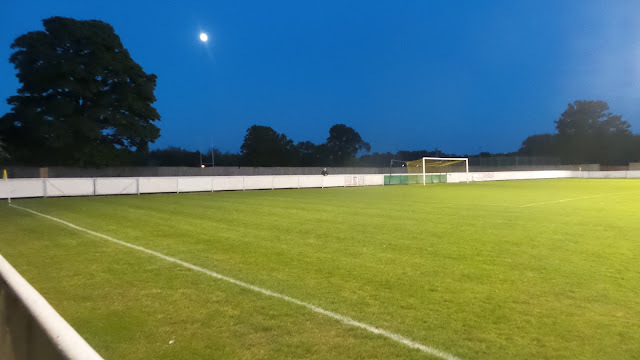 The main seated stand holds 250 and the ground has an overall capacity of 2000 with the only other cover being thanks to an overhang on the clubhouse. The clubhouse is decent enough, with real ale in bottles and various drinks on draught such as Strongbow and Strongbow Cloudy Apple. 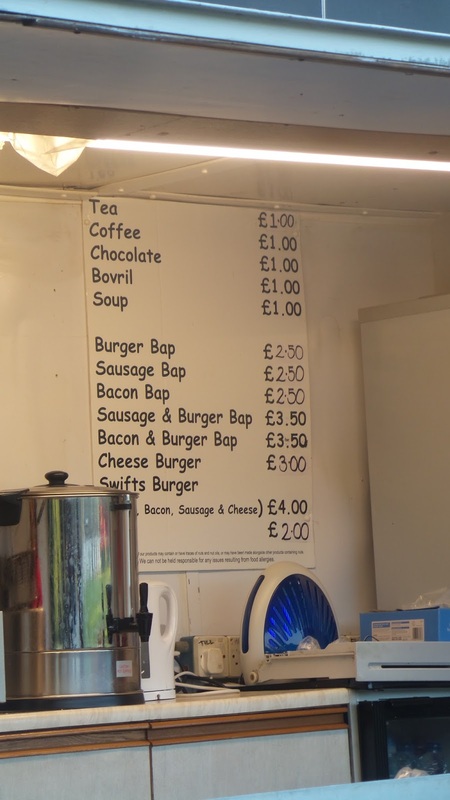 The tea bar offers the usual burgers and chips, although the town is probably a better bet, with a wide range of places within a 5-10 minute walk.